Fish, meet barrel. 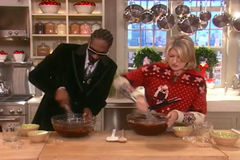 When Snoop Dogg visits The Martha Stewart Show, of course the plan is to bake brownies together, just to set up a pot joke. Says Snoop Dogg, "Trying to make some brownies, but we're missing the most important part of the brownies." Martha replies "You want green brownies... the greener the better" And then they break into an awkward rap. Martha Stewart is street! All I want for Christmas is a Snoop Dogg Cookbook. Martha, Marijuana in brownies is not passe. "Budder," as it's called, can be used in any recipe. It's a good way for those who wish to reap the many benefits of Cannabis without smoking. Marijuana is oil and alcohol soluble. If a recipe calls for oil, fat or butter to be added, Marijuana may be included. Marijuana can also be added to alcoholic beverages. 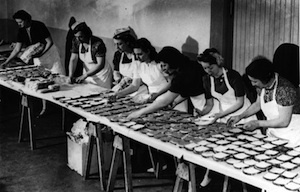 Historically, Cannabis tincture was used as a medicine. Thank you for being positive about Marijuana! I make cookies, brownies, breads, jams, olive oils and all the good things out of budder to benefit medical. There are all kinds of ways to use marijuana in food. My biggest fans are Cancer patients and Aids Patients.....Go Snoop...Go Snoop! Snoop officially jumped the shark as a rapper...he's now simply a responsible family man blending in with Martha's bland show. Snoop has become a nice, stable guy, coaching his son's football team, making food recipes on TV, and showing a total loss of edge that made him Snoop 15 years. Time goes by, things change, people change, Snoop changed - it's alright ... just please don't act like your cool Martha. Yeah, you have a rap sheet, but you didn't listen to rap when it was really rap! The man is a walking exhibit in tastelessness. And his admirers considers his use and promotion of recreational drugs to be his biggest feats, besides his rap.